He said he's looking at it as "a chance to say thank you." President Barack Obama will give his farewell address in the same place he gave his 2012 election night victory speech. He'll say goodbye Jan. 10 at McCormick Place in Chicago. In a note posted on the White House website, Obama said he's just started writing the speech, which will be "a chance to say thank you." But we think we have an idea of what he'll say. The 44th president has already gotten sentimental about his eight years in office. In a series of tweets on New Year's Day, he reflected on what he believes to be his administration's greatest accomplishments. Among those are job growth, clean energy and the Affordable Care Act, also referred to as Obamacare. 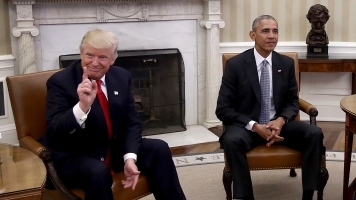 Related Story Should We Expect Trump To Repeal Obama's Executive Actions On Day One? That health care legislation is especially important to Obama. He's spending one of his last days in office meeting with Democratic legislators to figure out how to stop President-elect Donald Trump and the Republican-led Congress from repealing and replacing it. Obama also said his farewell address would "offer some thoughts on where we all go from here." That could give him another opportunity to give the new administration some subtle parting advice. "If we don't have a strong Transatlantic Alliance that's standing up for those things, we will be giving to our children a worse world. We will go backwards instead of forwards," Obama said at a joint press conference with German Chancellor Angela Merkel on Nov. 17. Obama said during his end-of-year press conference Dec. 16, "Our vulnerability to Russia or any other foreign power is directly related to how divided, partisan, dysfunctional our political process is." Obama will officially become a private citizen Jan. 20, when Trump is sworn in.